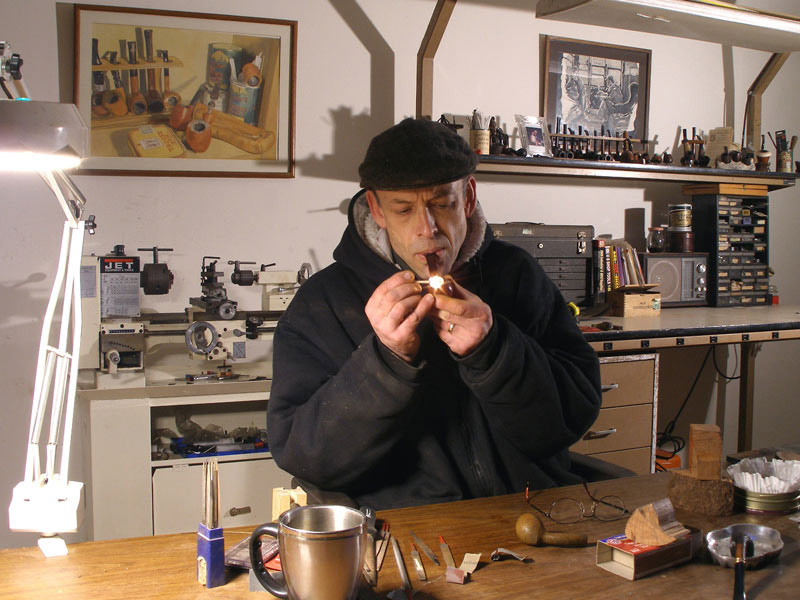 I met Brad Pohlmann at the Chicago Pipe Show many years ago now. Being a resident of Oregon for many years I was intrigued that he was a Oregonian and a pipemaker. I looked forward to meeting him as I saw in the adverts for the show that he would have a table there. I looked at his pipes at the time but could not afford one and none of them really grabbed me so I passed on from there to thinking that one day I would find a Pohlmann that caught my eye. My initial impressions of the pipe really include what drew me to this piece of pipe art enough to want to add it to my collection and make it a part of my pipe journey. It is a medium or group 4 sized pipe. Its dimensions are a well-balanced 5 inches long and 2 inches tall. The tobacco chamber is 1 1/2inches deep and 3/4 inches in diameter. 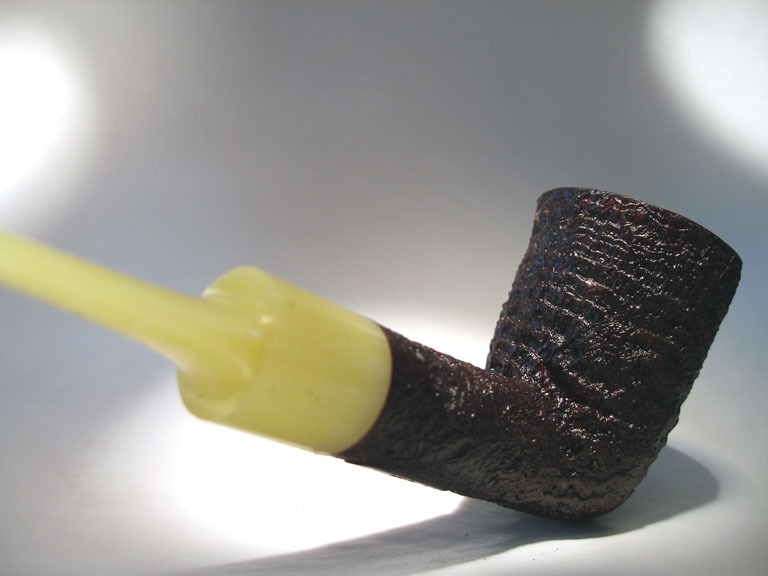 There is a narrow band of briar that separates the shank from the stem and provides a smooth transition from the sandblast to the smooth finish of the Bakelite. The dark oxblood stain of the sandblast finish and the same colour smooth band and rim work well with the shape of the pipe. The stem is a handmade saddle shape from a yellow coloured Bakelite. The stem shape and colour work well with the oxblood stain of the sandblast and smooth portions of the bowl. The button on the stem is thin and comfortable. When the pipe arrived it was an impressive piece. 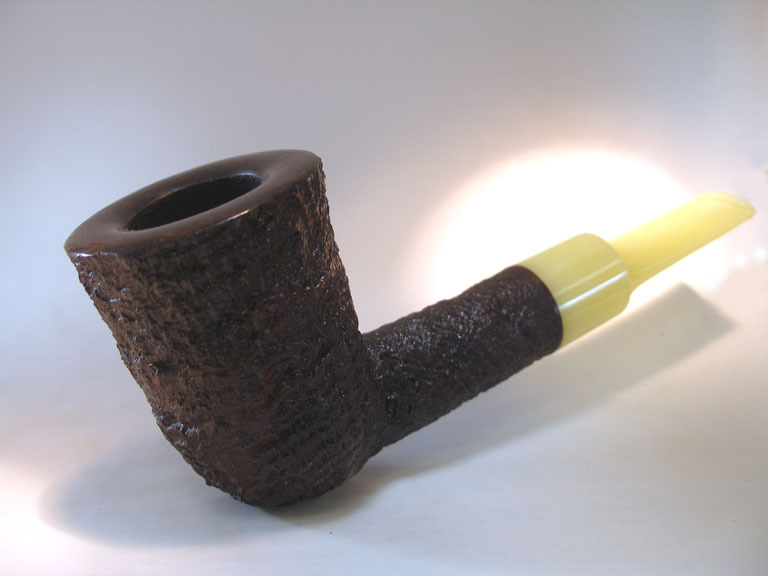 The workmanship of the pipe, the deep and craggy sandblast ring grain around the entire bowl and radiating across the shank gave it very tactile feel that captured me. Some pipes like this one and the Roush leave a lasting impression in my mind. I still remember sliding the pipe out of the sleeve and enjoying the look and the way it sat in my hand. Brad had made a very beautiful pipe that was now mine. It had the faint aromas of the Virginias that its previous owner had smoked and the bowl had no cake at all. In fact it did not even look to have been smoked to the bottom of the bowl. The smooth rim has some swirling grain on it and the arched appearance gives it a touch of class. Examining it up close it is obvious that it is blasted with a master hand. There is a smooth, oval medallion of briar on the bottom of the shank that provides a spot for the stamping. On the underside of the stem it is stamped with an arced Pohlmann over USA. The symmetry of the pipe is easy on the eyes. The balance between the height of the bowl and the length of the shank is perfect. The stain has variation and almost a sparkle when moved in the light. The yellow Bakelite stem stands in stark contrast to the oxblood stain on the bowl and together give the pipe a dressy and classic look. The inner mechanics of the pipe are perfect. The drilling is perfectly executed from the shank and into the bowl – coming out exactly centre in the bottom of the bowl. The airway from the bowl into the mortise is centered. It is smooth in its entrance to the mortise and the mortise itself is also smooth with no rough spot left by drill bit. The end of the shank is sanded smooth and is finished. There is a bevel in the shank end to accommodate the tenon and provide a snug fit against the shank. The bowl itself is U shaped and smooth from sides to bottom. The air way enters the bowl and is smooth and clean.The draught on the bowl is wide open and effortless. Looking at the Bakelite stem one is struck by the retro look of the old stem material. The saddle shape works well with the material and the Dublin shape of the pipe giving it a classic style that works with just a little flair of modern. It is hand cut out of a piece of Bakelite. From the saddle back it is well tapered with good even angles top and bottom progressing to the button. There is a slight wavy pattern to the Bakelite that makes it have an amberlike look in the light. The blade of the stem that is put in the mouth is thin and comfortable. 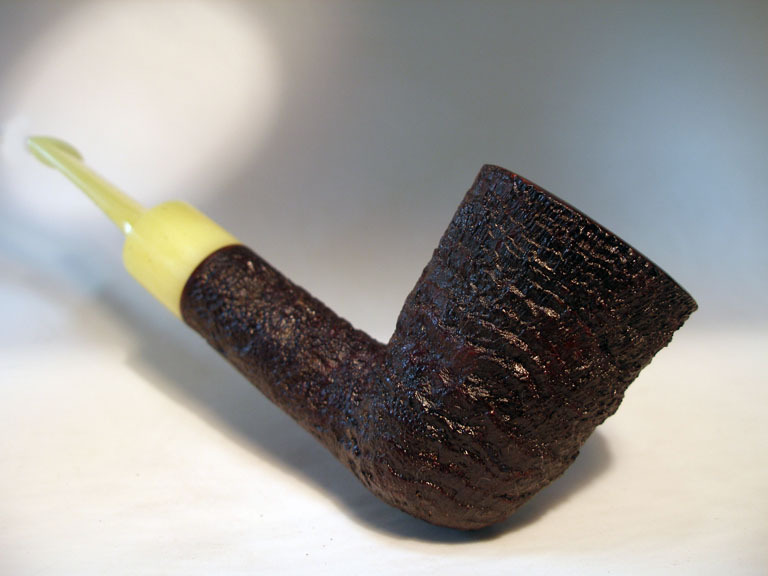 Brad did a great job shaping the stem and capturing a shape that really works with this pipe. The tenon is white Delrin that has been inserted into the stem for durability and ease of use. The airway is funneled slightly for a smooth transition from the mortise when it is in place. There is a very minimal gap between the end of the tenon and the base of the mortise. The transition where the Delrin meets the Bakelite of the stem is seamless. There is no lip or rough spot at that junction. The draught of the stem is unrestricted and open. When the pipe is put together the draught is effortless. The fit of the stem to the shank is very well done. The button is cut to my liking with a good sharp inner edge and tapered to the tip. It is a thin button with material enough to provide an edge that fits behind the teeth. The slot is rectangular with rounded edges and deeply funneled to deliver a uniform airway from bowl to button. The inside of the slot is sanded smooth and polished. The airway is absolutely smooth from slot to tenon. The overall construction of this pipe is very well done. It is light in the hand and in the mouth. The shaping of the stem is exactly what I like in terms of the feel in my mouth. The blade from the button to the saddle is deep enough to give room for how it sits in my mouth. It is well balanced and tactile feel of the deep blast as it warms up during the smoking of a bowl is very pleasant. Like others in my American carver collection, I smoked the pipe at specific times in my life. It is a pipe I enjoy smoking when sitting on my porch or in my recliner. It is not one that I carry with me as an everyday pipe. That being said since I got it I have smoked it enough to have a good thin cake developed in the bowl. It is one that I have dedicated to Virginia and Virginia Perique tobaccos. It delivered a good smoke from the first smoke I had in the bowl and continues to do so to this day. It draws well; the lighting has never been a problem and continues to be an effortless smoke. Now that I am writing this review up, I have moved the pipe out of the cupboard and set it aside to enjoy Sunday afternoon. Thanks Brad for delivering a beautiful, well-made pipe that remains a very good smoking pipe to this day. If you can acquire a pipe made by Brad Pohlmann I can assure you that it will not disappoint you and you will find that it will become a favourite in your rack. One of the things I love about pipes is that they live far longer than the original owner. I hold it in trust while it is in my care. The craftsmanship of this pipe gives the certainty that it will continue its journey well beyond the years that it is my companion. 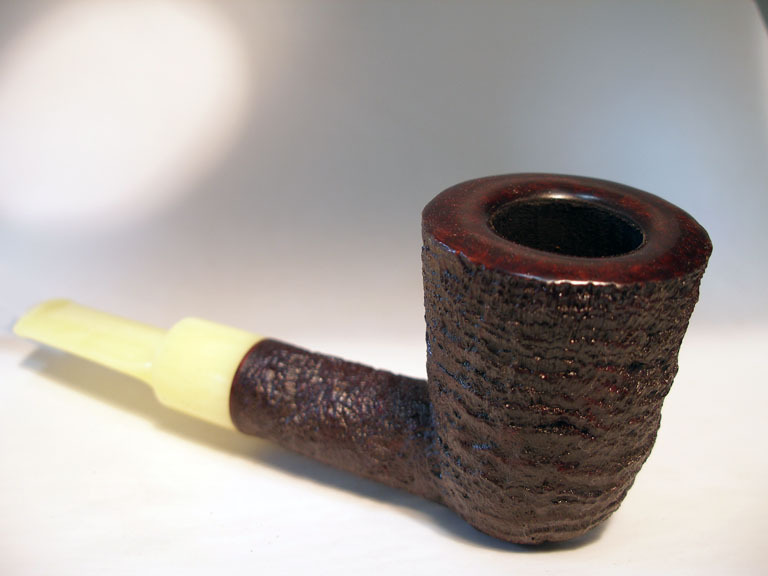 This entry was posted in Pipe Reviews and tagged Bakelite stem on a Pohlmann Pipe, Brad Pohlmann Dublin Pipe, Brad Pohlmann Pipes, pipe reviews, Pohlmann Pipe review, Pohlmann pipes on December 13, 2014 by rebornpipes.